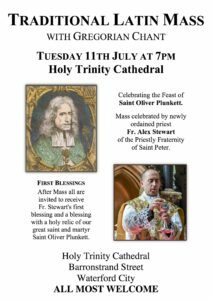 Priests of the FSSP offer Holy Mass at SS Peter & Paul’s Church in the centre of Cork for about one week in every month, usually around the second Sunday of the month. Sunday EF Masses are at 12noon and weekday EF Masses at 10:30am. On the same Sunday, there will be an EF Mass at 5pm in St Alphonsus Church, Barntown. Juventutem Corcaigh schedule Masses also at SS Peter & Paul’s for 8pm on the Friday preceding the second Sunday, which Mass will usually be offered by the same FSSP priest visiting Cork that week. Likewise at 7:15pm on the Monday following he will give a talk to members and guests of Juventutem Corcaigh at the presbytery opposite SS Peter & Paul’s. There is usually a social gathering after both the Friday Mass and the Monday talk. 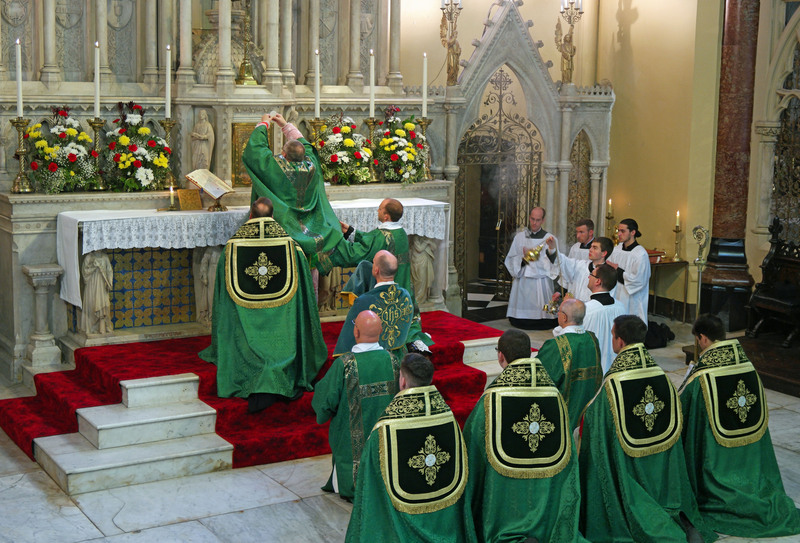 Fr Komorowski, FSSP normally offers a Sung Mass at Waterford Cathedral on the fourth Sunday of each month at 10am. See John Briody’s photos here. The poster to the right is from 2017. Every year there are several FSSP clerics present at the FOTA conference (photo top). The XI FOTA conference will take place in Cork from 7-9 July 2018.